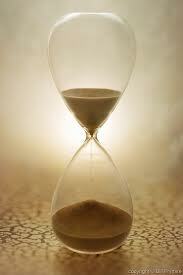 Time, that fleeting commodity that holds us while on this earth! Yet, we can't hold onto it! And for all of us, time is ticking away. We are closer to the end of our earthly journey every second that we live. 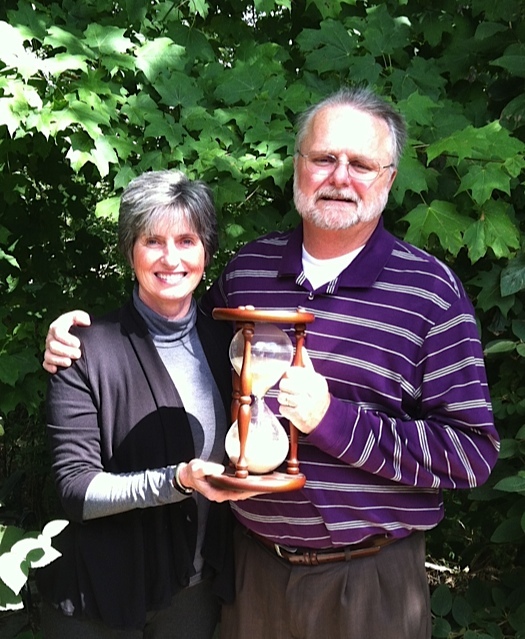 A few years ago, my husband had what I call "a heart episode" -- not a heart attack, praise God, but an issue with his heart rhythms that sent him to the emergency room. Since John had had a "widow maker" heart attack several years before, the docs decided to keep him in the hospital and run some tests. I kissed John good-by that night and went home. I had perfect peace that John was in good hands...and most of all, the Great Hands of our Healer God! Exhausted by the long day, I hastily sent out an email to some of our "prayer peeps," asking for prayer for John and signing it with Acts 13:36a. The Lord had just reminded me of this verse a week or two before as I was sharing with a small Bible study group. My friend Jenna, who had been a part of that group, jokingly responded to my email, "Are you sure you want Acts 13:36? Are we praying that John live or die (fall asleep)?" My fascination with this truth began several years before. My husband John was leading us through the book of Acts in our kinship group. Maps went up on the screen, the journeys of Paul were clarified, even drawings and photos of archaeological dig sites were explained and imagined! I don't remember much to tell you the truth. But I do remember the above verse. It really hit me like a ton of bricks...and as I've meditated on it and mulled over it for days and weeks and months and even years, it has brought me tremendous encouragement and peace. Why, you may ask? For those of you who may have been confused as to my verse -- it's a great comfort to me that our life on earth will not end until God has fulfilled His purpose through each of us in our generation! Amen to Acts 13:36A! And isn't that what life is all about for us children of God...to so let Him live and love and serve through us that His great purpose in His Son, from before time began, will be worked out in and through our human lives on this earth. What an awesome privilege and hope! We are part of something bigger than us! There's a song that I discovered last year that makes me think of my Acts 13 verse. It wasn't long after hearing for the first time this haunting melody (Johann Sebastian Bach's melody "Wachet Auf" played on folk instruments) and the accompanying song, that I started playing it in my car on my way to work each day. It moves me to think that the Lord Christ uses the work I do each day to accomplish His purpose -- to glorify Himself and build His kingdom. That's because He lives His life through me His child, His disciple, His instrument. Jan, when she has served the purpose of God in her generation, will fall asleep...into the Arms of Abba Father God! ________________, when he/she has served the purpose of God in his/her generation, will fall asleep...into the Arms of Abba Father God! Oh Father, may I serve your purpose in my own generation! To offer the work of my hands. That will glorify You great Name. To cover the work of my hands. Your grace for thorns in my path. And a harvest of life is grown. 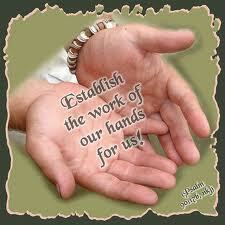 Establish the work of our hands. In every small and great task. And all glory to Your Name. The clock is ticking...the 2012 calendar pages are getting ready to close... And as they do, I'm happy to introduce you to another "guest branch." Sue Cutting is a long-time friend, sister in the Lord, fellow homeschooler of yesteryear...but most of all a devout and earnest follower of our Lord Jesus Christ. So join me in reading and reflecting. Thank you, Sue, for these wise words. A collection of hourglasses is gathered on a small, round table in our home. They are visible reminders of time relentlessly and silently slipping away. At this point in our lives, more minutes are gone than yet remain and we want to be on guard against “time thieves” waiting to steal our treasured moments. We remind ourselves that we can’t afford to waste time worrying. It is far better to pray, meditate on truth – and trust God. We can’t afford to squander our days chasing fantasies or amassing more trinkets destined to rust, corrode or be eaten by moths. No time left to “impress people” at the expense of pleasing God. No time left to expect others to meet the deepest needs of our hearts – because only God can do that. We have these fleeting sands of time to live intentionally, thankfully, being mindful of the beauty around us and the multitude of blessings from a good God. The privilege and responsibility of sharing this Good News with succeeding generations becomes more precious and pressing as the hourglass empties.